If you’re looking for more short-term trend plays, then I’ve got your fix. And this time, I’m serving up a couple of short-term channel setups on GBP/CAD and GBP/JPY. GBP/CAD has been trending ever lower for some time now. And if we connect the most recent peaks and troughs, we can see that the pair has been moving lower inside that there descending channel. And looking at the chart above, we can see that the pair is currently testing the channel’s support area, and support appears to be holding. 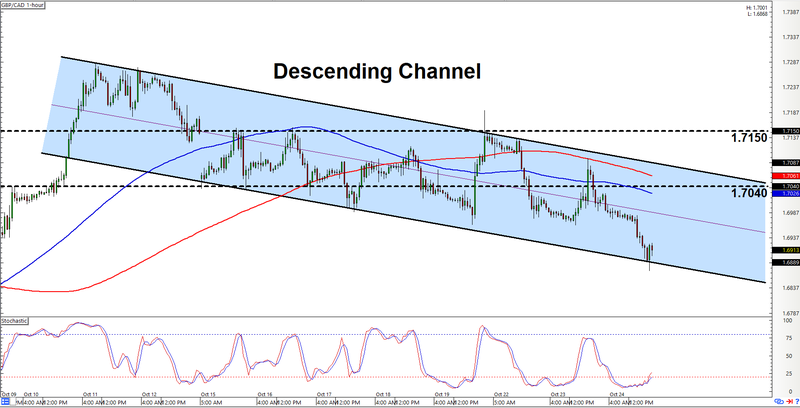 And since stochastic is moving back up again, it’s likely that the pair may move back up towards the channel’s resistance, which should be at or just above the area area of interest at 1.7040. Y’all may therefore wanna put this pair on yo watch list since a chance to go short may present itself sooner or later. As always, there’s always a slim chance for a topside channel breakout. And if that happens, then a move higher past 1.7150 would invalidate the channel while also confirming the topside breakout. 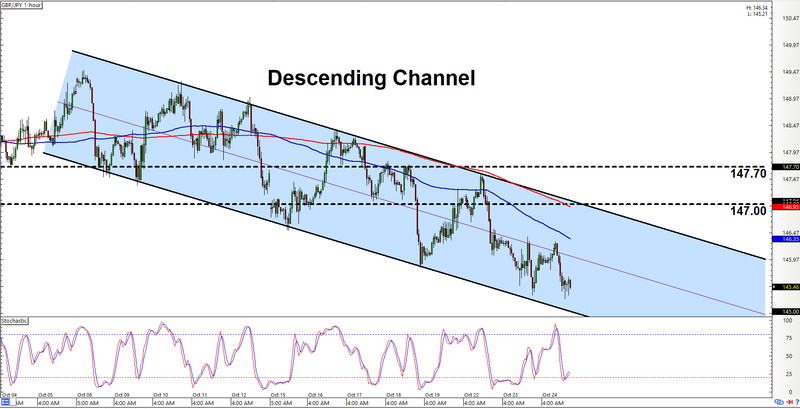 GBP/JPY’s price action has also been tilting to the downside while also apparently trapped inside that there descending channel. And presently, the pair already appears to be finding buyers close to the channel’s support. If the pair does pull back up, then bulls will likely be gunning for the channel’s resistance, which should be at or just below the 147.00 major psychological level. And if the pair does move back up to test 147.00, then that may present a chance to start looking for opportunities to go short on the pair. Just watch out if the pair continues to move higher and then clears 147.70 on strong bullish momentum, since that would be a sign that bulls are starting to win out. At any rate, y’all just make sure y’all remember to practice proper risk management as always, a’ight?